Today you can learn how to code online, entirely for free. Gone are the days where learning to code was reserved for the select few, or cost quite a hefty amount of money. It’ll give you the freedom to build apps, websites, and other projects with ease. Whether you want to start your own career as a programmer, learn how to build websites, or create projects for fun, this post is for you. 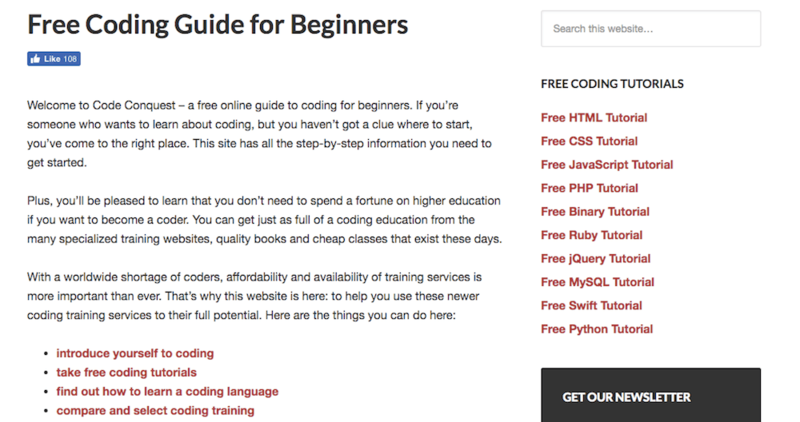 Below we dive into the best places online where you can learn to code for free. P.S. If you’re looking for a reliable place to hone your coding skills, we have just the thing! An entirely free web hosting platform where you can put your newly learned skills to use. Alternatively, you may get premium hosting at Hostinger with 30 days money back guarantee for a more robust and powerful hosting environment. BitDegree offers a ton of free courses that range from programming to game development. They offer standard online courses and gamified courses. Gamified courses help to bring achievement and interaction into the learning process. All you have to do is choose your language and start learning. BitDegree also does something unique by incorporating blockchain into the education process. There are transparent rewards and an achievement system that helps businesses recruit tech talent, and measure course success. 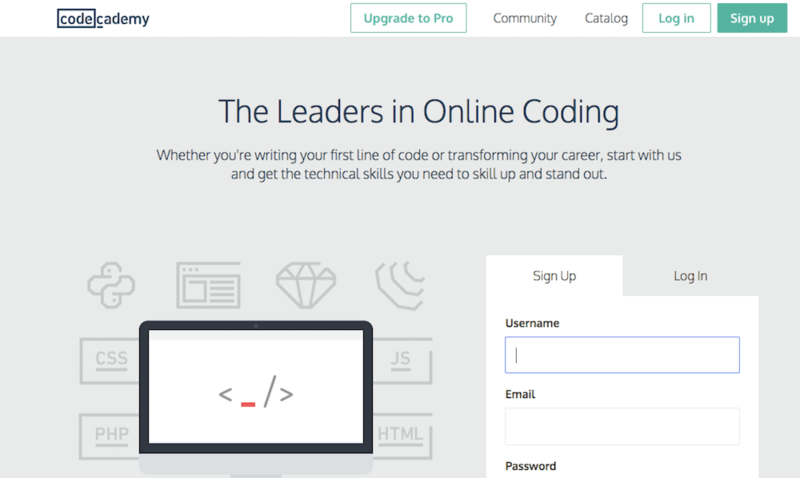 Code Academy is one of the most popular sites where people learn to code for free. More than 24 million people have learned to code using this platform. They offer courses ranging from introductory programming to more advanced languages. The interactive learning approach lets you immediately apply what you’ve learned. There are over 300 million hours of free coding content available to take you from complete beginner to working programmer. There are several other courses available as well, but the languages above are the core focus. The OpenCourseWare Initiative brings all of MIT’s undergraduate and graduate courses online. Even without getting into MIT you can get an MIT-level education, provided you have the motivation to complete the work. There are a lot of different subjects available, one of those being computer science. You can go through the degree program, or take individual courses. For example, you’ll find a variety of introductory computer programming courses like Python, C and C++, and Java. Free Code Camp is all about creating real-life relationships and building a community around programming education. It provides the chance to learn coding by participating in various challenges. You’ll get access to programming tutorials and courses to help you complete each challenge. Best of all, you won’t be coding alone either. There’s a community forum with others who are learning alongside you. And you have the option to meet other coders who happen to live in your city to exchange knowledge. Code School is an online learning platform that offers both free and paid courses. It’s currently impacted over one million students across the globe. You choose your education path that’s created by professional instructors and work through the material. You practice what you’ve learned directly in your browser window, and get immediate feedback. You rack up points as you complete each course level. You monitor your progress and keep track of all your achievements, badges earned, and material consumed. 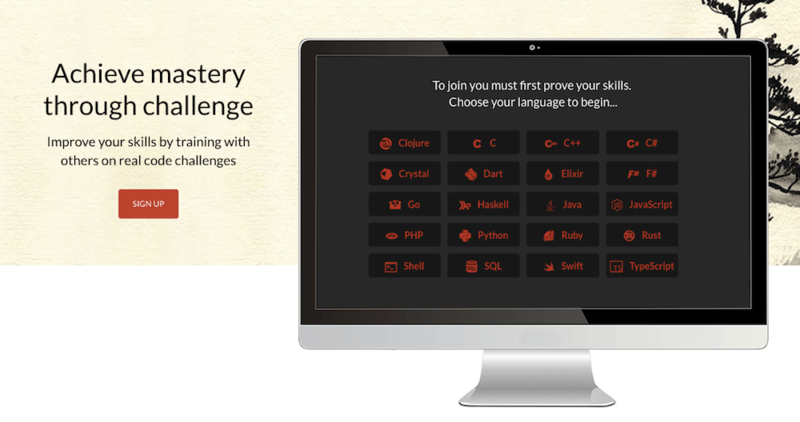 Codewars teaches you your desired programming language via a series of challenges. These code challenges draw from martial arts as each challenge is referred to as a kata. The goal of each challenge is to help you sharpen your existing skills with a certain programming language or to learn a new one from scratch. As you progress through each kata, the challenges will get tougher and tougher. Once a challenge is complete you’ll be able to see how your solution stacks up to others. This will show you different techniques for solving certain development problems. Dash is a free online course that’ll teach you the basics of web development, all within your web browser. With Dash, you’ll come away with an understanding of the bigger picture of website development. It’s a great place for beginners with no previous development experience. Code Conquest is a great platform that’ll help you learn the basics of coding. Even if you’ve never written a line of code in your life, or don’t even know what coding is, this platform will help you get started from square one. Choosing which languages to learn. Knowing how to improve your knowledge and skills. Applying these skills to real-life problems. Beyond everything above, you’ll receive specific recommendations to extend your education with different tools and platforms. The Odin Project takes all the guesswork out of learning web development. When you’re trying to learn to program on your own it can be difficult to put all the skills you’re learning together. You know the pieces to the puzzle, but you can’t quite figure out where they go. This platform has created a logical process from the best educational sources available on the web. Furthermore, you will learn to build projects along the way and have an active community to help you through the process. Code.org is built with the goal of making programming a part of the regular education curriculum. Over a million people have used this site to further their programming knowledge and skills. The education approach you take is up to you. You can dive into the one-hour tutorials, or take a more structured approach. There’s also a large catalog of courses that broken down by different age ranges from K-5, 6-12, and even University level. 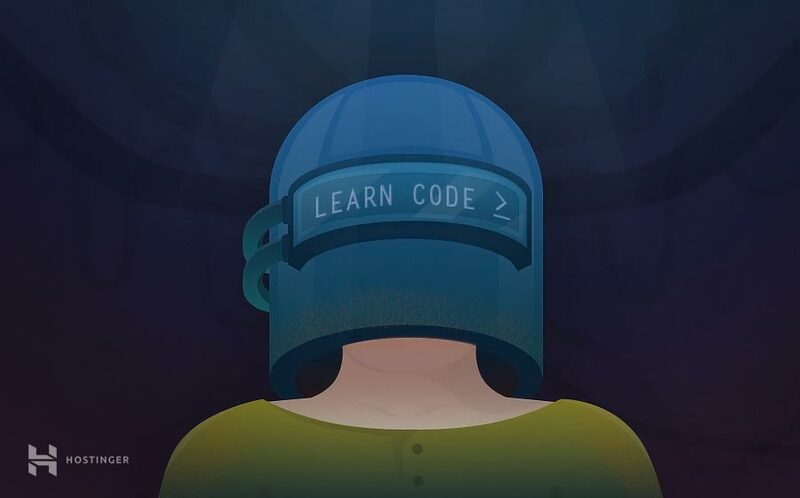 Code Avengers takes an interactive and fun approach to learning programming. 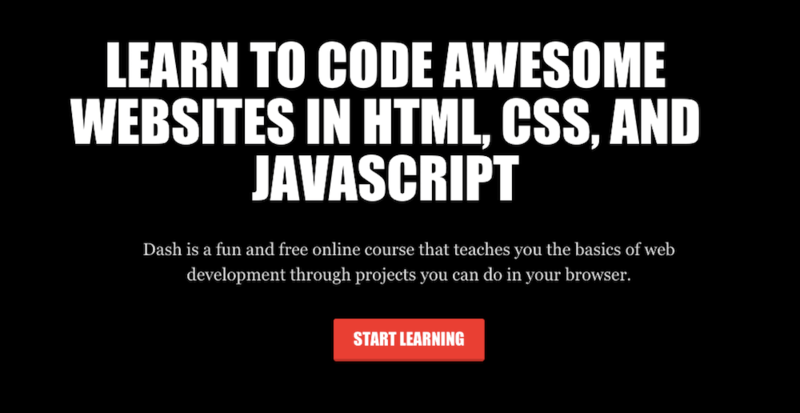 There are a variety of courses that’ll teach you how to code websites, apps, and even games. Each course on the site will take 12 hours to complete and is available in a multitude of different languages. Plus, there’s a community filled with programming experts to support you. There is a 7-day free trial that’ll help you determine if it’s worth investing in the entire program. Khan Academy is a massive online learning platform. It’s a great place to start developing a wealth of coding related knowledge and skills. You’ll find courses and tutorials that range from computer programming basics, all the way up to advanced applications. There are also foundational courses that teach you the philosophy and skills behind computer programming as a whole. edX is a massive open source higher education learning platform. It currently has a network of over 5 million students. The site is broken down into many different categories, that extend far beyond programming. Since you’re here to learn to code you’ll find the most value in the ‘Computer Science’ category. There are also paid courses available. But there are enough free educational materials to teach you the basics of coding. Web Fundamentals (previously HTML5 Rocks) is created by Google. Its goal is to provide useful and up to date tutorials about the web’s latest and best practices. 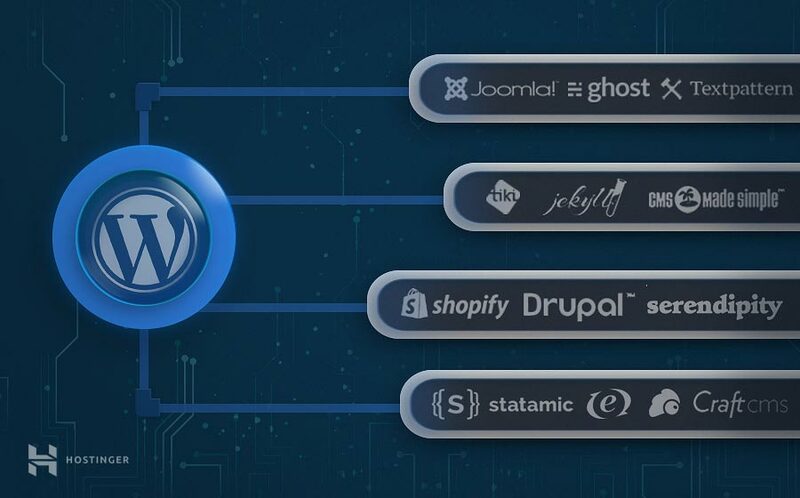 You’ll find a variety of tutorials that’ll help you learn the cutting edge practices for programming on the modern web. Since the site is oriented towards intermediate and advanced developers, you’ll want to have a grasp of the basics before you get started. But, if you’re looking for a great resource to help expand your knowledge of web development today, then this is a great resource. Codeasy.net offers a very unique and fun way to learn how to code. You’ll be immersed in an adventure story that requires real-life programming skills to navigate your way through. Throughout the story, you’ll be taught the basics of C#, all the way up to more advanced topics and functions. It’s designed with complete beginners in mind, so you don’t need any knowledge of software development to get started. The best part about this educational experience is that it doesn’t feel like you’re learning. Your goal is to save the world from a machine invasion, and you’ll use your newly acquired coding skills to do it. Hack.pledge () is a community made up of seasoned developers, who can share their knowledge and mentor the next generation of programmers. Here, you can perfect your development skills by learning from some of the top developers in the field. To get started you’ll sign the pledge, committing yourself to master craftsmanship in software development. Inside you’ll have access to a wealth of information that’ll help you step up your coding skills. Aside from learning, you’ll have the ability to connect with a mentor who’s currently at the top of their field. 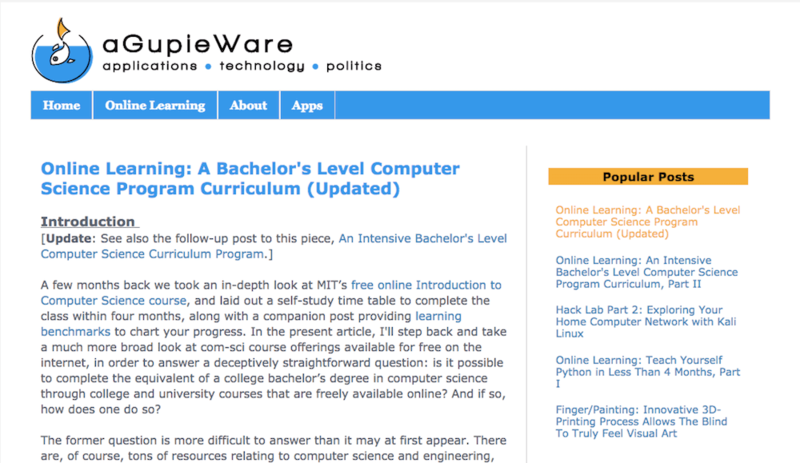 aGupieWare is a free online curriculum based on courses offered by MIT, Carnegie Mellon, Berkeley, Stanford, and Columbia. In this program, you’ll find 15 different courses which are further broken down into 3 introductory classes, 7 core classes, and 5 electives. Coursera provides coding-based courses, tutorials, and resources taught by professors at leading universities. 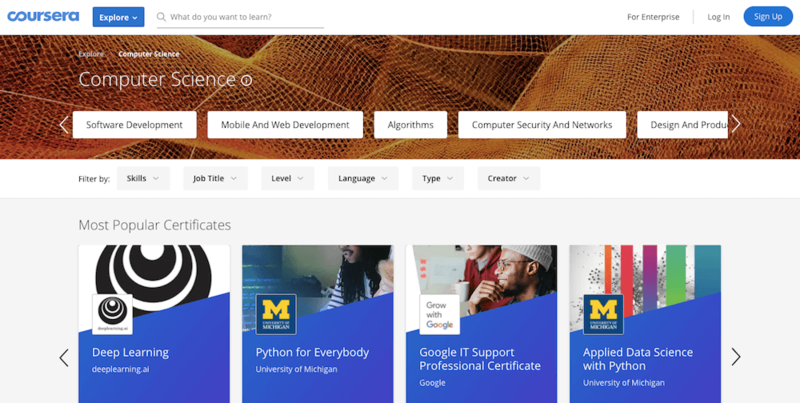 You’ll find hundreds of different coding-related courses to choose from. To develop these courses they partnered with some of the best teachers at top-tier universities. Which means you’re learning how to code from some of the best resources out there. Every course on the site is completely free, but, if you want to receive a certification, then you’ll have to pay for that. 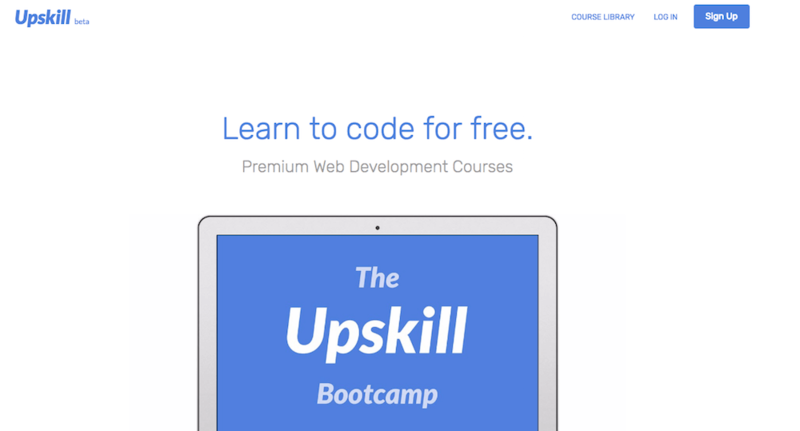 Upskill is a free online boot camp that’ll take you from beginner to advanced developer. The main focus of the course is teaching you web development, and it’s a great place to start, even if you have no experience. The curriculum is 100% project-based, which means that you’ll be building a real-world portfolio as you progress through the course. Udemy is an online education portal that offers thousands of courses. 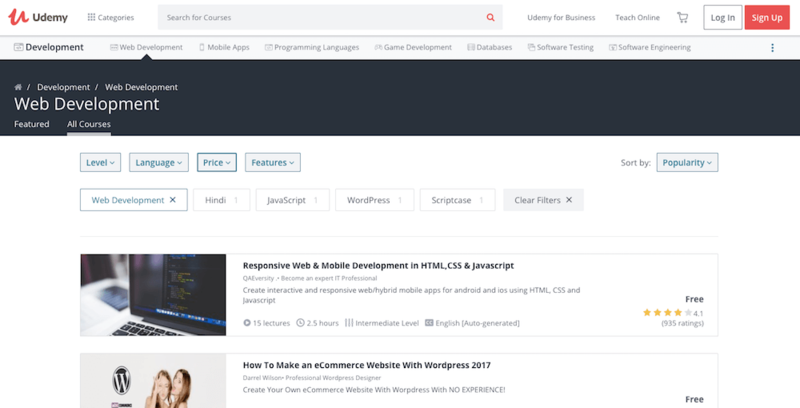 There are a lot of paid courses on the platform, but you’ll also find plenty of free ones as well. Plus, there are always coupons and specials where you can find discount and even free versions of paid courses. Learning to code used to mean hours and hours of expensive education. But, with all of the free coding resources available today you can learn to program in record time, with zero money up front. Of course, there is a multitude of paid programs and courses available as well. But the free resources above are more than enough to get you started and develop the foundational knowledge to succeed as a programmer. You don’t have to go through every single course or program on the list above, but instead, pick a handful that seem the most exciting and dive in. Have any questions, tips, or trick about code learning? Share them with us in the comments below! Programmers and software developers are one of the growing workforces in the present market. With the growing popularity of online businesses, programming is surely one of the best career choices to make at the moment. Great point, I couldn’t agree more! Thank you for this informative post. I chose General Assembly because I am familiar with their brand and they have a location where I live. Within minutes, I was learning to code with their Dash course. Again, thank you. That’s a great list, Kevin. However, nearly all above-mentioned course/tutorial providers provide content for nearly all programming languages/frameworks. Hence a newbie learner would be confused which learning platform to choose out of the lot. For ex. if one is interested in learning Python, all the above-mentioned platforms provide Python courses/tutorials. To solve this dilemma, Hackr.io (https://hackr.io) is the programming community where learners can find the best online programming courses and tutorials recommended by the community. PS: Sorry for the self-promotion ( Am Hackr co-founder) but I thought of informing the readers about the possible solution. freeCodeCamp has a very supportive community and forum to help when learning to code.